The Cuisinart FCT23-24NS is a non-stick crepe pan. The pan is made up of professional triple ply stainless which is designed to provide optimal heat and consists of of a pure aluminium core enveloped by pure stainless steel. The high-polished induction-ready stainless steel exterior and interior ensures professional cooking performance. The pan has stainless cooking surface which does not react with food or alter flavors and also has heat surround™ technology that provides consistent, even heat distribution along the base and side walls of cookware. The pan also features an elegant, stainless, riveted handle which remains cool and provides a comfortable grip. 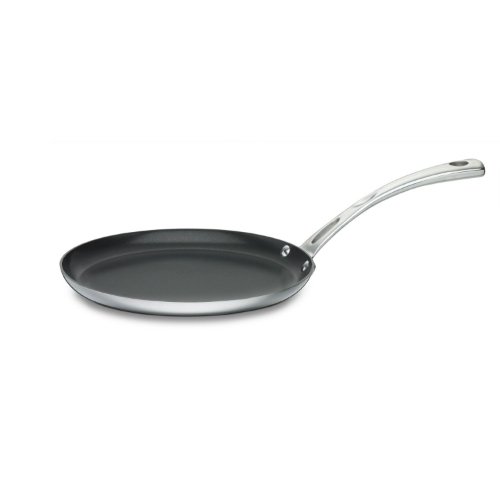 The Cuisinart Stainless Steel Non-Stick Crepe Pan - 10 Inch has many exciting features for users of all types. You can extend the lifetime of your Cuisinart Stainless Steel Non-Stick Crepe Pan - 10 Inch with the purchase of a FactoryOutletStore Factory Protection Plan. The Cuisinart Stainless Steel Non-Stick Crepe Pan - 10 Inch is sold as a Brand New Unopened Item.